Fire Emblem Awakening (ファイアーエムブレム覚醒, Faiā Emuburemu Kakusei?) is a tactical role-playing video game developed by Intelligent Systems and published by Nintendo for the Nintendo 3DS. 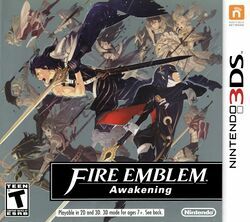 It is the thirteenth game in the Fire Emblem series, and the second Nintendo developed 3DS title to utilize paid downloadable content. The game was released on April 19, 2012 in Japan, and was released on February 4, 2013 in North America, available both at retail and digitally through Nintendo's eShop. The story focuses on the trials of Chrom, the prince of the Halidom of Ylisse, and his companions during a turbulent era. When the neighboring nation of Plegia starts acting suspiciously, Chrom commands his band of soldiers, the Shepherds, to keep his country at peace. He encounters an unholy force called the Risen plaguing the lands and a masked swordsman claiming to be Marth, the Hero-King of Legend. The game is a turn based tactical role playing game, where the player must move their characters within a grid. The game involves moving characters into positions in order to attack the opposing side, or defend against their attacks. Characters possess a certain number of health points; when attacked, they are subtracted, and when all health points are exhausted, the character is defeated. Battles are typically won by attacking the opposing side until all enemy characters have lost all of their health points. Many new features, or features rarely present in the series, have been added to the game. The "Avatar" system, originating from Fire Emblem: Shin Monshou no Nazo: Hikari to Kage no Eiyuu returns in greater detail, allowing the player to create and customize their own playable character. This page was last edited on 4 February 2017, at 20:53. This page has been accessed 26,277 times.